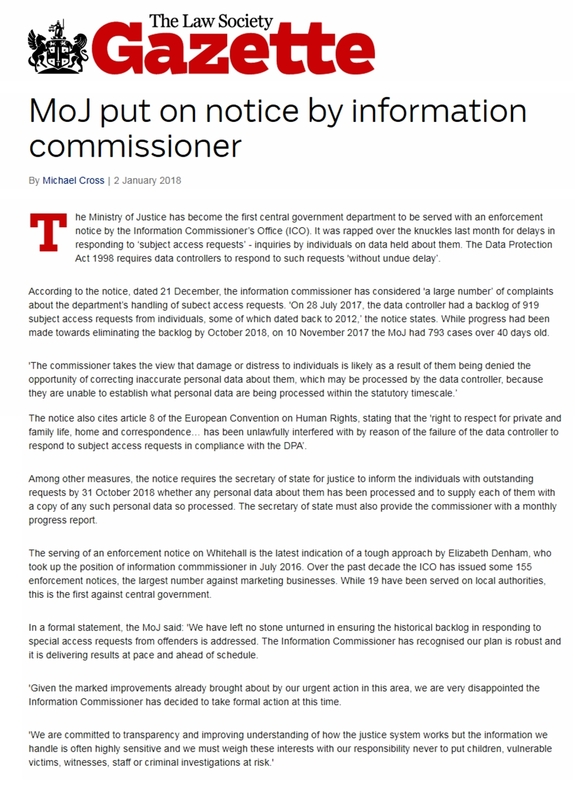 As of today, the 2nd of January 2018, the Information Commissioners Office has put the Ministry Of Justice on notice for failing their legal duties for not answering Subject Access Requests in the timeframes (40 days) that the Data Protection Act (1998) allows for. This is a very significant and important enforcement notice, the legal ramifications will run world wide. Read the article below and make sure you pay good attention to the dates, and how they correspond to our SAR template, published on the website. All of this is down to you guys. You have all been very busy sending the SARs to the MoJ and they have clearly not been able to keep up. Well done and keep on sending! Ask the questions, things are changing. The fact that the ICO are actually going after the MoJ tells you everything you need to know. Nobody is above the law. In case you weren't aware, the MoJ is actually the ICO's parent department and provides funding and resources. Talk about biting the hand that feeds you! We have created a SAR template for you to download and edit, then send of to the relevant body / organisation / Government department / Council etc. They are obligated under the DPA 1998 to provide you with the information requested. Be specific and name everything you require that is related to you as a person (legal fiction) remember, everything that has you name, and is related to you is covered by a SAR.